We're an award winning Web Design & Digital Marketing Agency based in Ashbourne, Co.Meath. Modern, functional and easy to use Web Sites. These are the three most important criteria that go into the web sites designed and developed at TrinitySeven Studio in Ashbourne, Co.Meath. All web sites are defined in consultation with client’s needs and through an ongoing process of communication the end product is a result of successful co-operation and collaboration. TrinitySeven Studio Ltd was set up in 2008 by Will Quigley as a response to the growing business generated by his previous enterprise eSOL Internet & IT Solutions also trading as WillQuigley.com. 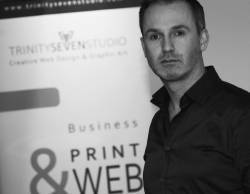 With over a decade of experience designing web sites and working as a graphic artist, the time had come to offer all the benefits of a limited company to our clients. Since starting up in 2005, eSOL Internet & IT Solutions quickly earned a reputation as one of Irelands most accessible web design businesses, creating web sites and corporate/promotional art work for a range of clients in Ireland and the UK including Corporate Businesses, Restaurants, Hotels and Fashion Houses. In 2011 TrinitySeven Studio Ltd moved to our new offices in Ashbourne, Co.Meath. It's the perfect location for services existing and new clients based in Dublin and the surrounding counties. Now, TrinitySeven Studio Ltd has been further strengthened by creating partnerships with other companies who outsource their web design needs to TrinitySeven Studio and also with print companies in order to provide a complete one-stop-shop for web/design/print services to clients. Services include web site design, custom graphic design and custom web development as well as full print management for all printing jobs. If you have a project that needs web design, brand design and marketing material - both print and digital, feel free to drop into our office in Ashbourne, Co.Meath or call us on 01 8353913 or send us an email to info@t7.ie.